These guys obviously missed the Backcountry Journeys blog post from earlier this month. Remember the one? About the man arrested for taunting bison at Yellowstone National Park in late July. We only touched on that situation to remind us all of our responsibility towards ourselves, wildlife and others, while visiting National Parks. This again? Already? Of course. This sort of behavior has been going on since the dawn of the Parks System, if not longer. Three people are facing criminal charges after they entered a closed area at Katmai National Park in order to get a closer look at feeding brown bears in the popular Brooks Falls viewing area. At Brooks, brown bears congregate, sometimes in large numbers, to feed on sockeye salmon in the Brooks River. Three wildlife viewing platforms along the river offer safe viewing opportunities, at the same time minimizing potential human impact on the bears. The park relies on visitors to adhere to park regulations to protect themselves and bears. Brooks is one of the more, if not the most cherished places for all of us at Backcountry Journeys. We travel there biannually (in July and September) for our Brown Bears of Katmai tours. It is one of the best places in the world to photograph brown bears swatting at salmon as the fish try to jump the falls. If you’ve ever seen a photograph of a bear catching a salmon from a waterfall it was most likely captured at Brooks Falls. We feel extra ownership for its protection so that we can continue to be allowed to view the brown bears there from such an amazing perspective. This place is special, and it can be taken away if we aren’t careful. On Aug 9th one of the members of the aforementioned group, according to NPS spokespeople, just couldn’t help himself as he approached within feet of five bears feeding in the river nearby. This cargo shorts wearing selfie hunting buffoon now finds himself in proverbial extra hot water as he unknowingly did all this perfectly in frame for the Brooks Falls live stream, broadcasting himself being a total tool across the internet. The livestream broadcasts the action at the Falls to a global audience throughout the summer as the bears fish. A number of folks watching contacted park officials. After snapping his selfie, the man remained in the river for approximately 90 more seconds, taking photos and squatting oddly in the water, seemingly trying to get the bears’ attention. He’s lucky they didn’t notice. “People need to recognize that these are wild brown bears. The possible consequences for the bears and themselves could have been disastrous,” said Mark Sturm, Superintendent of Katmai National Park. In Katmai, approaching within 50 yards of a bear using a concentrated food source, like migrating or spawning salmon, is prohibited. Because of concentrated bear activity at Brooks Falls, area closures are in place from June 15 through August 15, in order to allow bears access to essential food resources that allow them to survive through the winter. These closures help prevent negative bear-human interactions. Wading in the river and even fishing is allowed as long as you maintain the legal distance from bears. Let us all be examples of how to (not)interact with wildlife correctly. As photographers, it is especially important to respect the wildlife we are targeting. Even while shooting landscape work we must keep in mind our responsibility to be mindful of how our presence affects where we are and the “local’s” homes we may be encroaching upon. We have a responsibility to help protect the environments in which we are operating, and the animals we photograph. And to respect ourselves as well as others around us. We cannot risk the lives of these amazing creatures, nor should we risk our privilege to be in places where we can see and photograph them in their natural environments. Let us all remember each time we are out there that we are the guests. 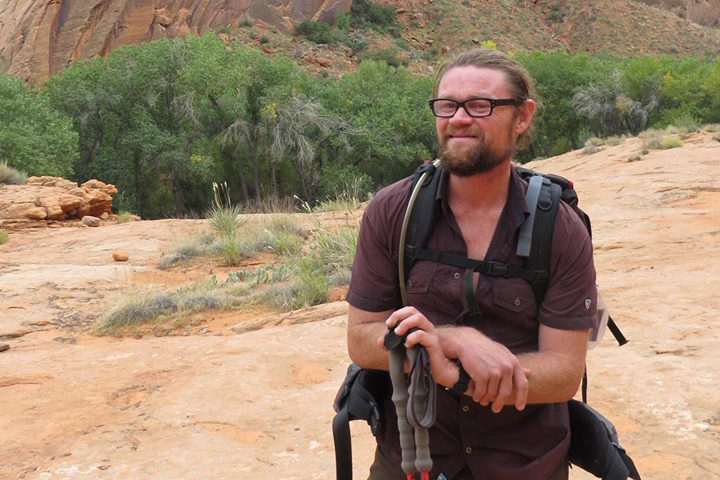 Kenton Krueger has spent the past several years guiding guiding backpackers, hikers and photographers into the wild places of the American West such as Havasu Falls, Grand Canyon and Yellowstone National Parks as well as in the Grand Staircase Escalante in southern Utah. In addition to backpacking and camping, his adventures include rock climbing, exploring the slot canyons of southern Utah, mountain biking, and bagging 14ers in Colorado’s San Juan Mountain Mountain Range. Kenton is a trail runner, former pilot, newspaper photographer and writer. Kenton looks forward to utilizing his years of guiding experience, combined with his passion and experience behind the lens to provide memorable and unforgettable experiences at the wild places we will visit together.